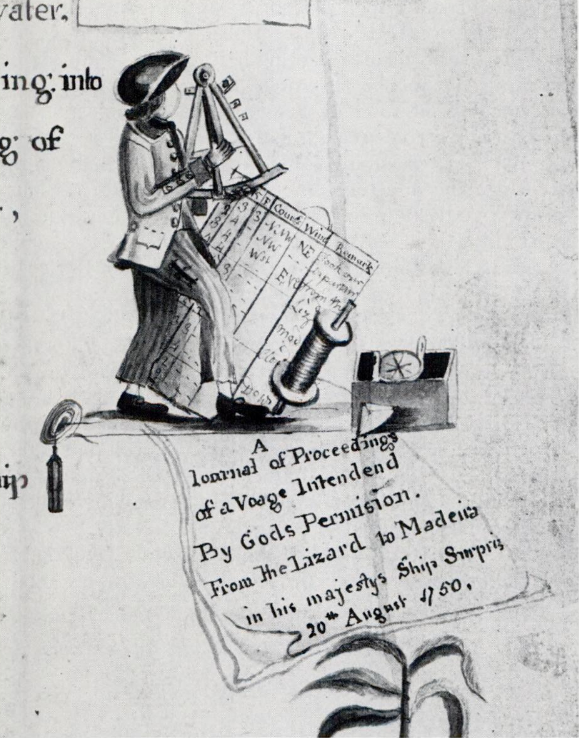 Detail from "A Book of Drafts and Remarks," Archibald Hamilton, 1763, National Maritime Museum. Found in Background to Discovery by Derek Howse, University of California Press, 1990, page 163. Special thanks to Tom Apple for pointing out this fascinating image. It will come as no surprise to regular readers here that I have a fascination with navigation in the eighteenth century. This sketch by Archibald Hamilton, a master's mate, depicts a fellow of the same rank (or perhaps the man himself) at work with an octant. At his feet are the tools of his trade: a lead line, compass, chip log, and traverse board. As Mr. Apple wrote not long ago, the latter three are essential to dead reckoning. 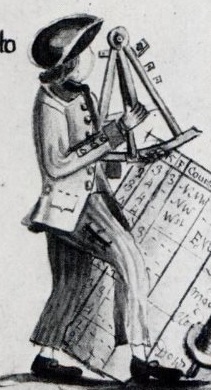 What is even more interesting about Hamilton's sketch is the figure it portrays. Master's mates were assistants to the master, who was responsible for the navigation of naval vessels in the eighteenth century. You can learn more about masters by reading Lena Mosser's excellent post on their role and rank in naval society. Hamilton and his fellow mates would rank as petty officers on the ship, exempt from standing watch, but shouldering more responsibility. They would have had to possess some skill in the art and science of navigation. Hamilton's illustration accompanies a journal charting the voyage of the Surprize from England to the Portuguese island of Madeira. Our mate wears a cocked hat with narrow brim bound in light colored tape. His hair is short, but not of a bob wig style. A black neckcloth hangs down over his chest, and he wears a fanciful jacket with a dark collar and cuffs. His mariner's cuffs, lapel, and vents all feature the same white metal or cloth covered buttons. Our master's mate's waistcoat is unfortunately not well detailed, but his trousers are striped with pockets cut well down the thigh. His trouser legs end above the ankle, revealing white stockings and round toed shoes with oval buckles.